Hello, I am a new user and I think this is an excellent appellation, but I did not understand how to share the expense with a group of friends. I did not understand how the daily average was determined. I appreciate your response. Hi Amit, at the moment you can’t split up expenses in the app. This is a feature that has been requested a couple of times and I’m planning to add it. However, it’s quite a bit of work and will need some time. The daily average is the sum of all your expenses since the beginning of your trip until today divided by the length of your trip in days. It only takes into account expenses that are within the time frame of your trip. I hope this clarifies things. Let me know if you have further questions. Thanks Amit. I just realized that this can happen when the trip’s start date is in the future. It looks like in your case the expenses are even dated before the trip’s start date. In that case they should not be included in the daily average at all. The daily average should only include expenses within the trip’s start and end date. I’ll fix that in the next update. A workaround for you to fix this is to exclude these pre-trip expenses from the average. You can do that when you tip 3-dot-menu on the expense creation screen. Hello and thanks for the quick reference. I just wanted to emphasize that the user will always take advantage of the budget before actually traveling. Buy airline tickets, hotel nights, insurance payment, visas and various orders. So that the daily budget must be the balance of the budget corresponding to all days of the trip according to the set date. I think the view should be the sum of the balance of the budget by days in the top row and the actual use of the bottom line. The amount in the top row must be changed on an ongoing basis according to the balance of the amount of actual use each day, so as not to exceed the budget determined not to end the trip with a negative balance. And thanks again for the effort. Perhaps the general budget should be divided into two, a part of the preparations that will only reduce the amount from the general budget and will be valid until the actual trip. 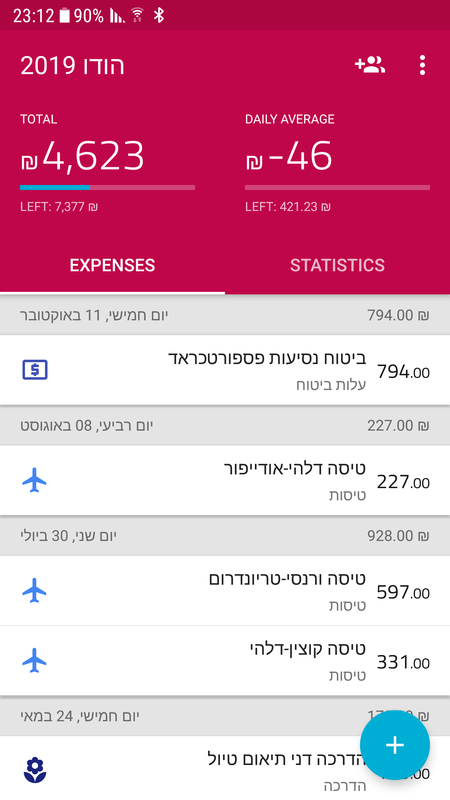 And the second part of the actual journey in which the reference to the daily average and the balance of money according to the actual expenditure on the days of the trip. I’m trying to keep it as simple as possible to avoid confusion. First of all, respect for investment in solving the problem. Any proposed solution will be excellent. In any case, the daily budget and the balance, it is very convenient to plan the expenses required for the duration of the trip. 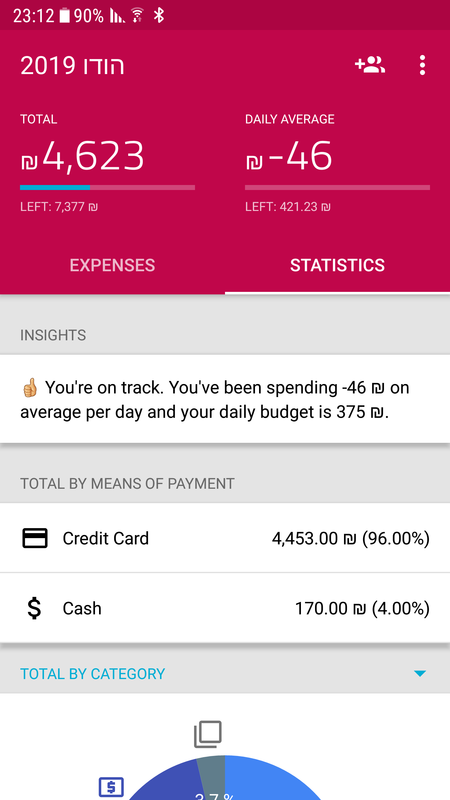 This means that the average daily change based on actual spend is, in my opinion, an important tool that will solve the user from a manual daily account. If you understand correctly, you build a formula like this: (General Budget - Expenses until Trip = Balance to Start of Trip / Actual Days of Trip = Estimated Daily Budget). And this leads us to the next calculation. (Daily budget - daily expenses / trip days = new daily budget). Just good and a wonderful weekend. New user of this very helpfull application, I have a question. I shared by mistake one or my trip with a friend, so he appears in my dashboard, and he can add expenses. Is it possible to delete him ? Hi Amaury, I can help you with that. Please write me an email to info@travel-spend.com and let me know your TravelSpend account email and your trip name. Then I will look into this.